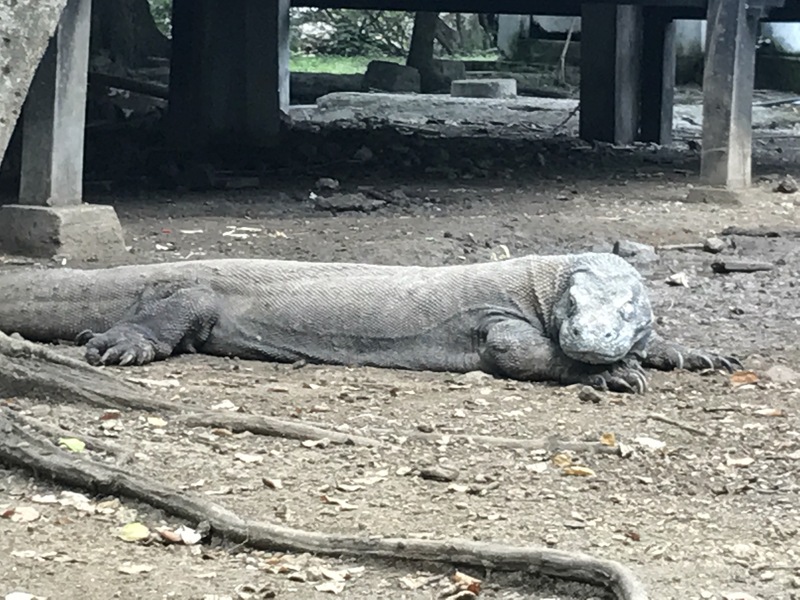 If you want to see Komodo Dragons in the wild, the only place to do so is in Komodo National Park, Indonesia. It is a beautiful area made up of 3 large islands and 26 small islands. 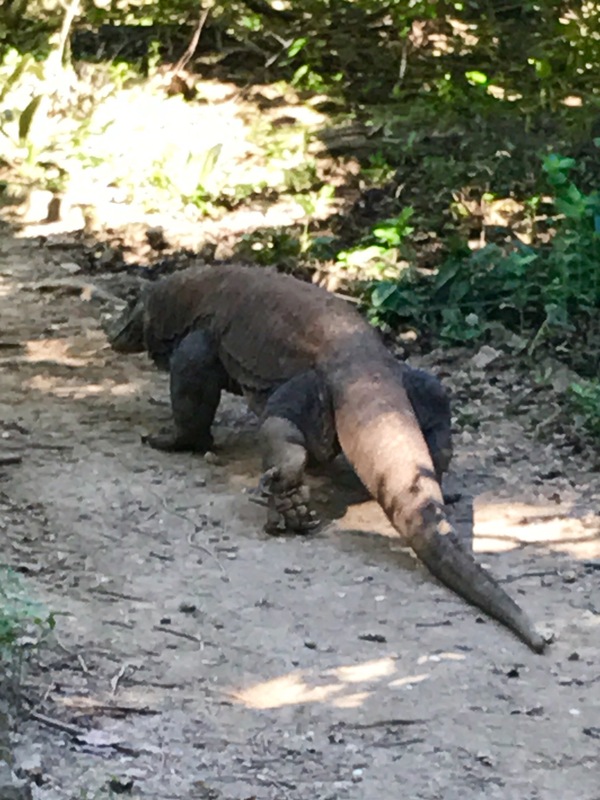 In our search for dragons, we were able to visit the two largest of these islands, Rinca and Komodo. This area has also been recently named one of The New 7 Wonders of Nature. 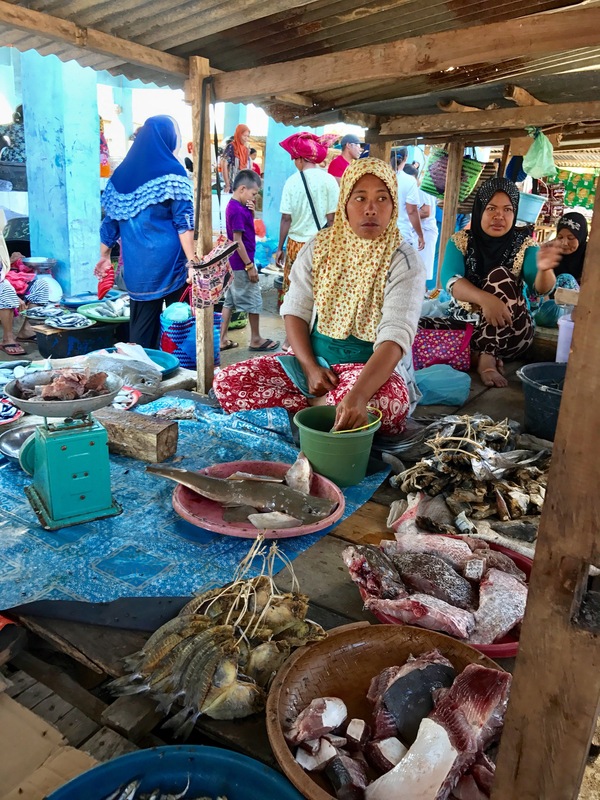 Indonesia itself consists of more than 17,000 islands and is the 4th largest country (by population) in the world, only behind China, India, and the USA. 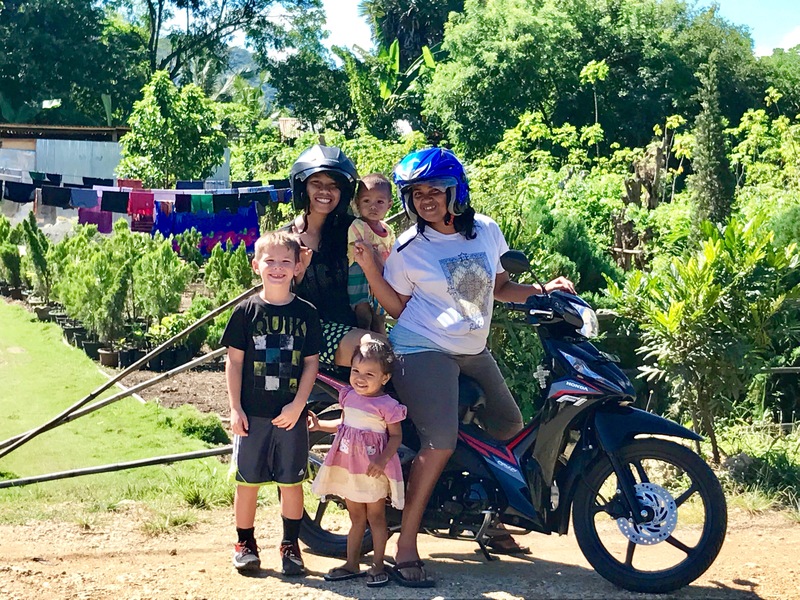 While they are all organized under one government, each island has it’s own unique wildlife, culture, and often language. 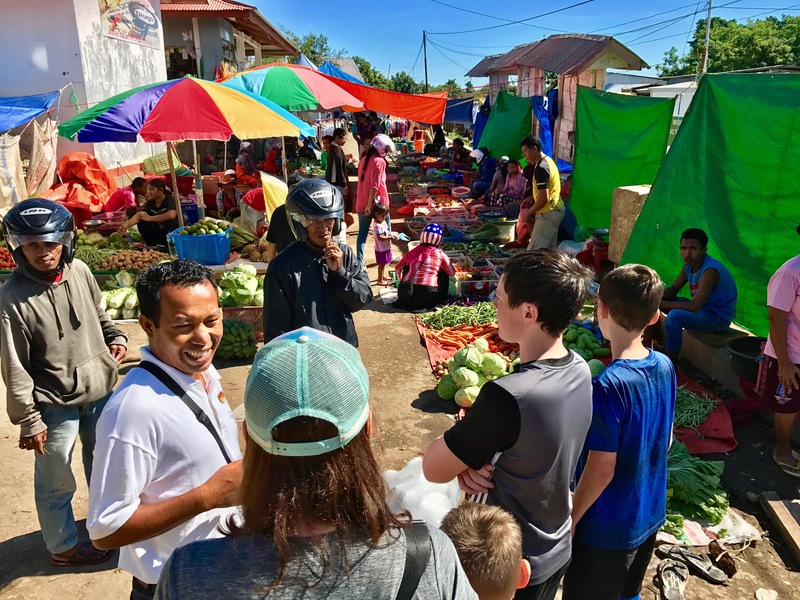 For example, on the island of Flores, which we landed on to begin our Komodo tour, the people are primarily Catholic, Bali is primarily Hindu, but the country as a whole is 87% Muslim. each of these islands also have their own native languages they spoke before they would typically speak Indonesian. 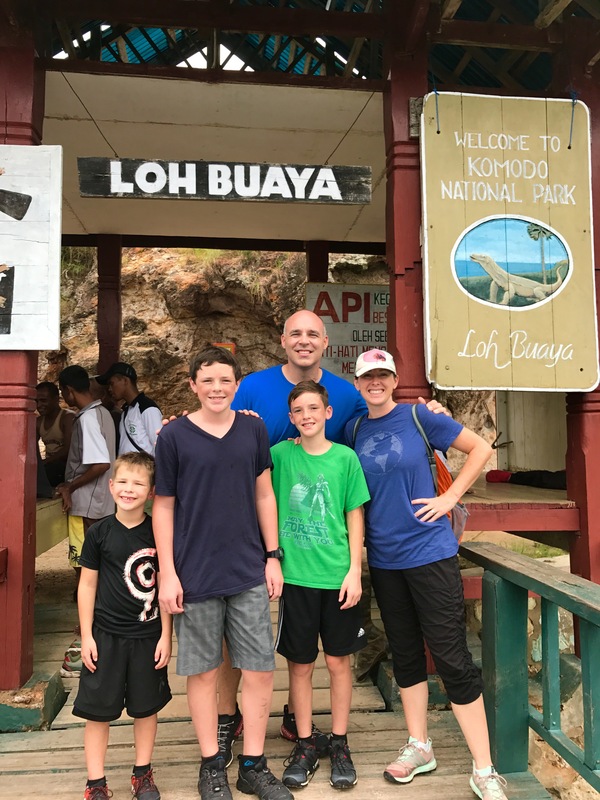 We enjoyed having the opportunity to visit multiple islands in Indonesia during our 6 weeks in the country because each one was so unique and special in it’s own way. 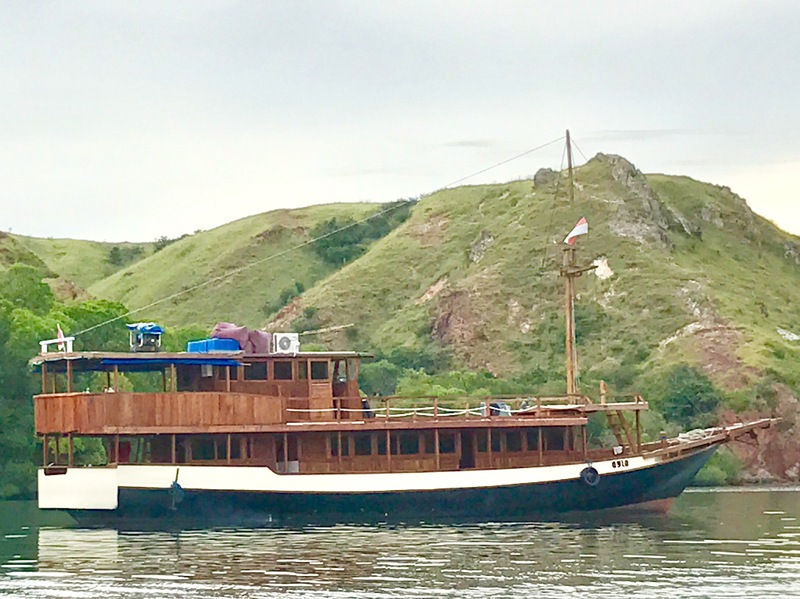 To get to Komodo National Park you have to fly to the island of Flores and hire a boat from there. Getting ready to board our plane for Flores Island! Flores was a beautiful island and I wish we would have had more time to explore the island itself. Our guide was a huge proponent of his island and often gave us a hard time for our quick visit to his home. He had attended tourism school on Flores and did a fabulous job at public relations! Looking down on Flores island from the plane. 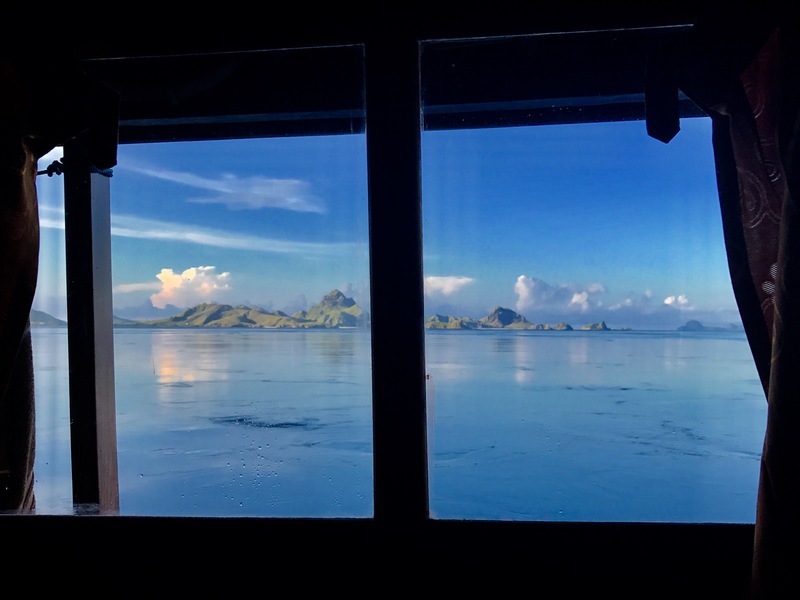 We arrived in Labuan Bajo and boarded the boat that would be our home for the next 2 days. 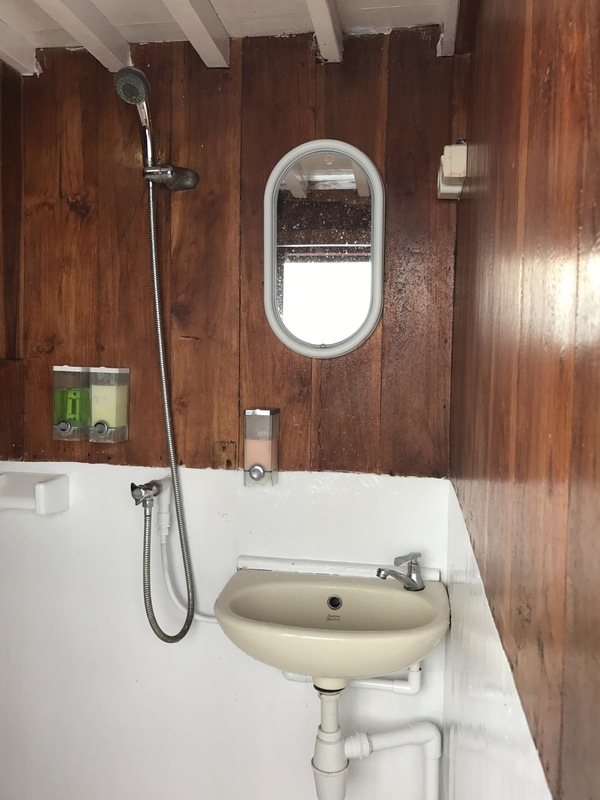 This boat was bigger than our boat for the orangutan tour in Borneo, with 4 small bedrooms, an eating area and a huge upper deck to relax and look at the beautiful scenery as we sailed past. Our chef in the kitchen cooking up some delicious Indonesian food. Not a bad view out our bedroom window on the boat! 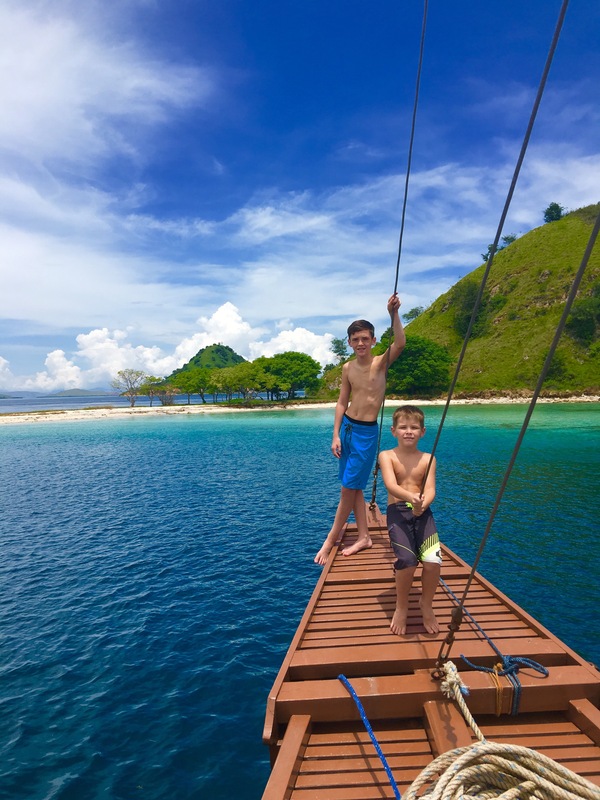 Since they are Dixson boys, they still found ways to climb while on a boat! 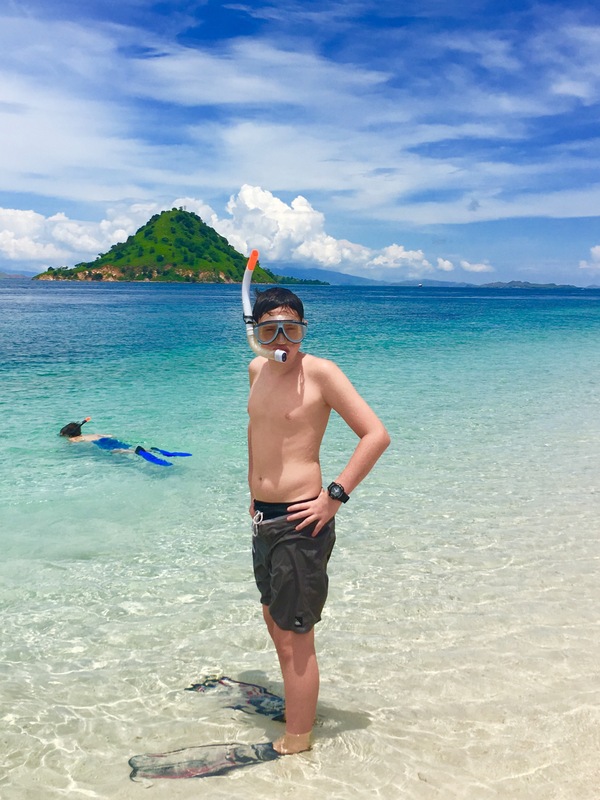 We sailed through the islands stopping at a small uninhabited island to snorkel in the crystal clear water. 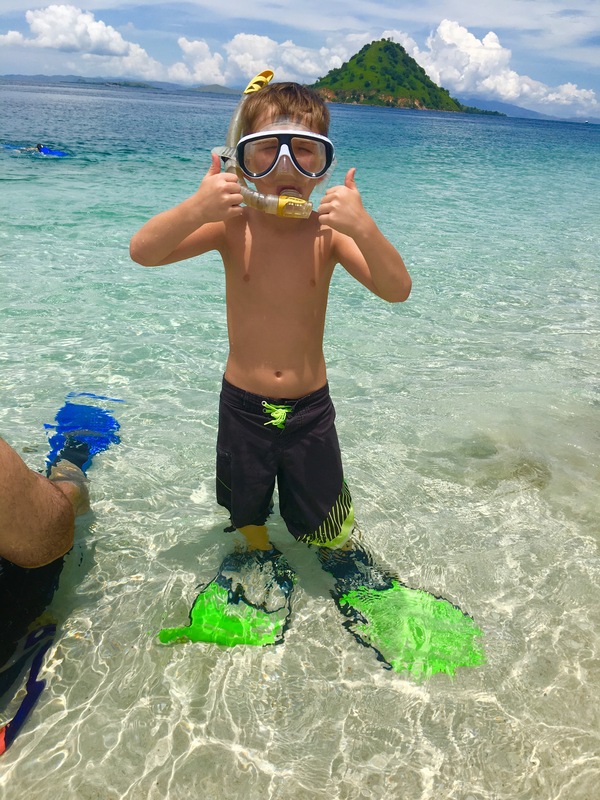 There was a huge variety of fish and other sea creatures and we had a great time snorkeling…until the jelly fish came along! We tried our best to swim around them, but there was just too many and even when they are little, the stings can be painful. 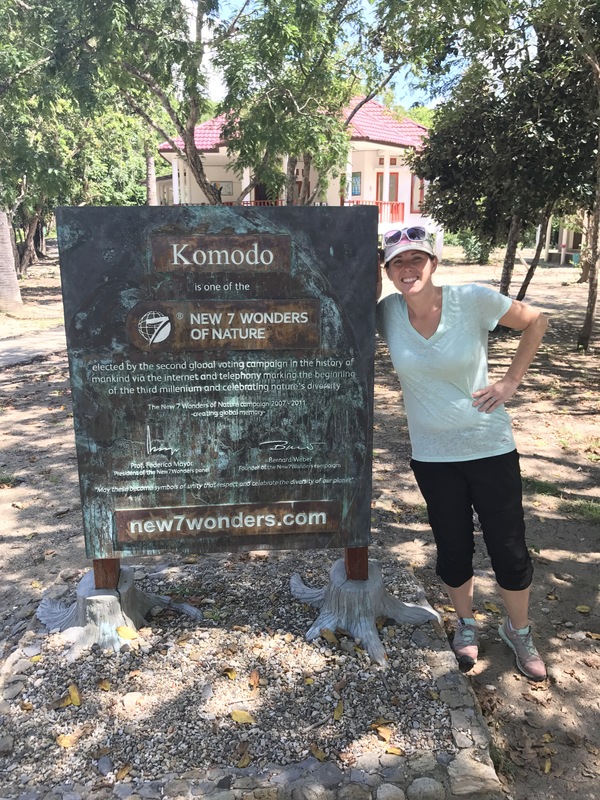 So we hopped back in the boat and headed the rest of the way to visit Komodo Island! Tyler hopped out of the water first and waited on the skiff that would bring us back to our boat. He seemed to be a magnet for the jellyfish. 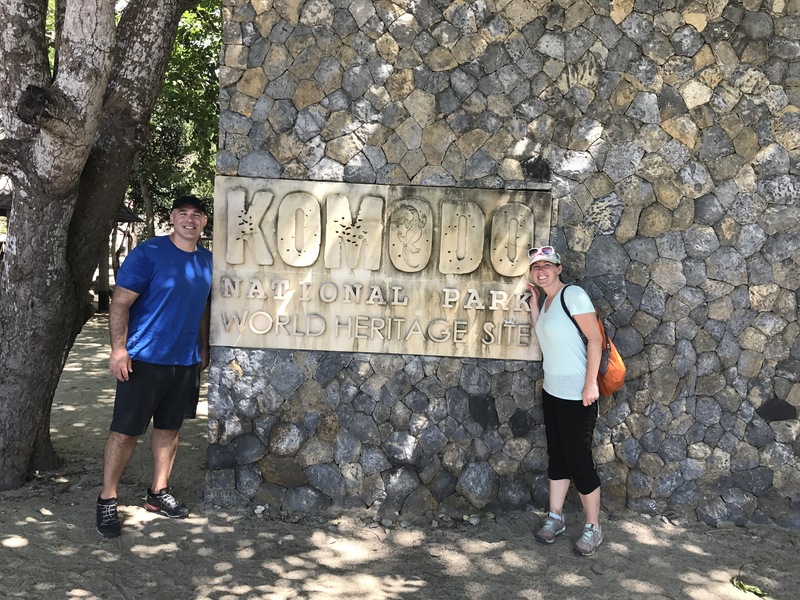 After snorkeling we headed over to Komodo Island where, accompanied by a local guide, we hiked around and were able to see about 10 Komodo dragons, and also a nesting area! Komodo dragons, a type of monitor lizard, are the largest living species of lizard and can grow up to 10 ft long! We saw some pretty big ones while we were there! While the dragons were amazing to see, the natural beauty surrounding us was almost as matchless, as we trekked around searching for them. I have pictures of Tyler doing handstands all over the world. In this picture from Komodo island, we are looking down at our boat in the bay below. After seeing the dragons, we rode in our boat out to a mangrove island that belongs to a community of bats, locally called “flying foxes” due to their enormous size. 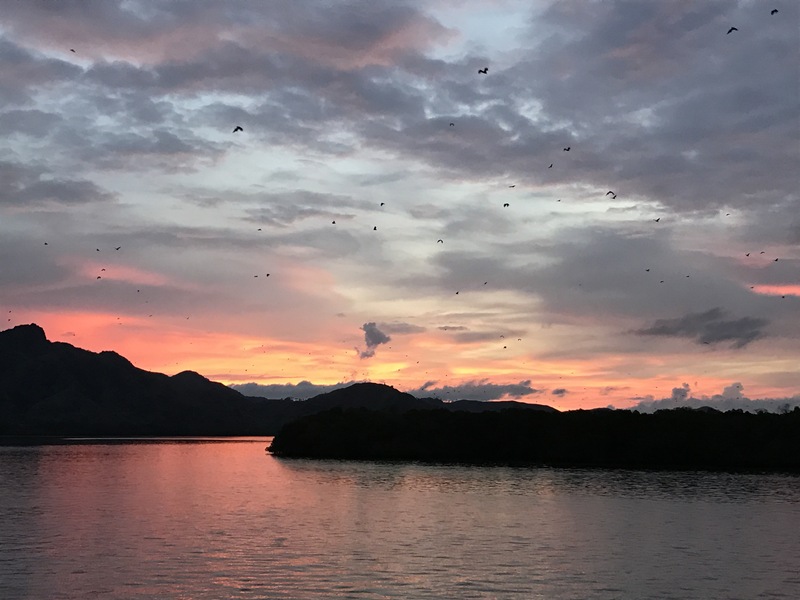 As the sun sets every night, thousands of bats fly from this island to the island of Flores to eat fruit from the trees there. 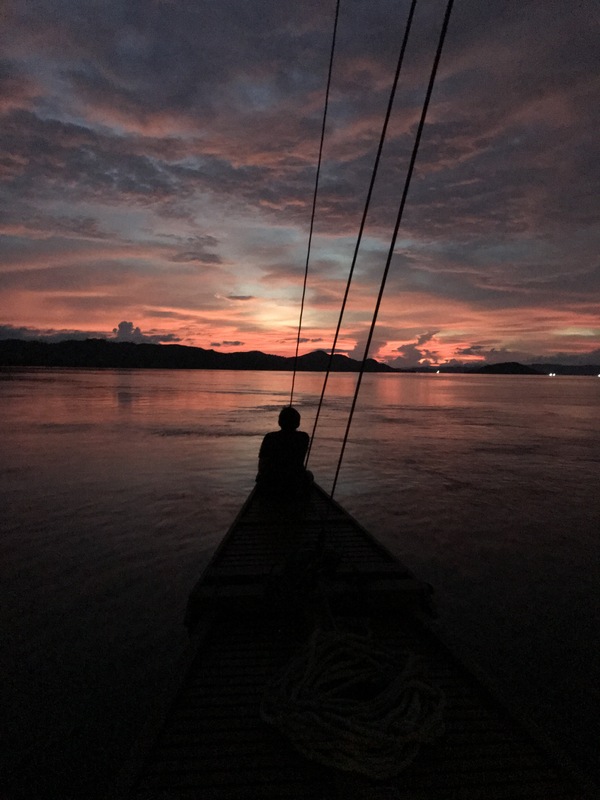 Our captain and crew anchored our boat near the island and we were able to sit back and watch as thousands of bats flew over our heads on their way to Flores. It was incredible!! After the sun had almost set and the “Flying Foxes” had all flown away, we drove our boat to where we were anchoring for the night. The stars were amazing as there weren’t any lights to be seen. When we stopped, we had dinner provided by our cook, fried chicken (because that’s what he thought Americans eat. Have I mentioned how you can find KFC’s everywhere in the world?) This was actually really nice because it was something Luke would eat! He had started eating rice (served at every Indonesian meal) with ketchup almost exclusively since we arrived in Indonesia. While we were eating, we heard a bunch of splashing around us in the water. We looked out and realized we were surrounded by schools of flying fish! They were jumping all around and continued through the night. After dinner, we retired to our rooms and fell asleep to the sound of the hundreds of fish jumping around in the water surrounding us. 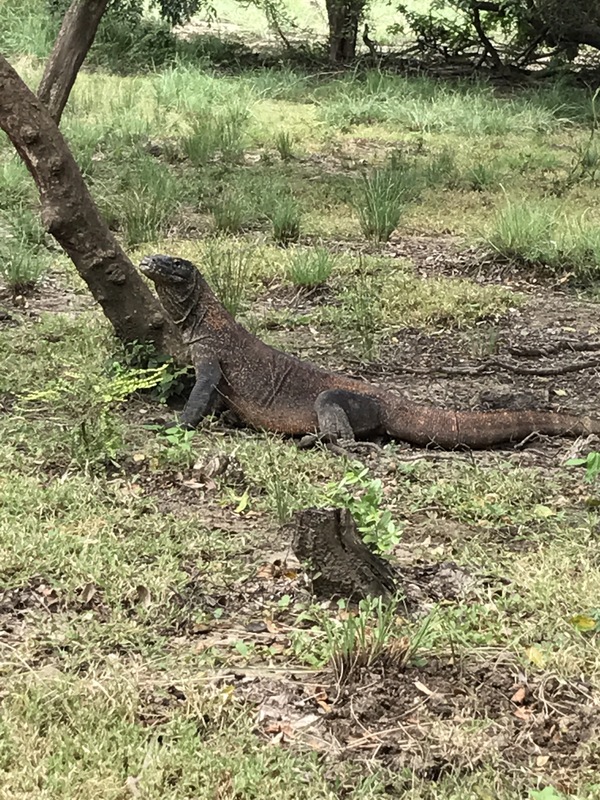 The next morning we got up early and drove to Rinca island to see more Komodo Dragons. We saw at least 25 as we trekked around the island. It was incredible! Our amazing guide George. He loved talking business with Jeromy. He had recently bought a pig and chickens and was going to raise those and make money until he had enough to buy a truck he could drive around the island to deliver things, because many of the villages were too far from town for people to get things. 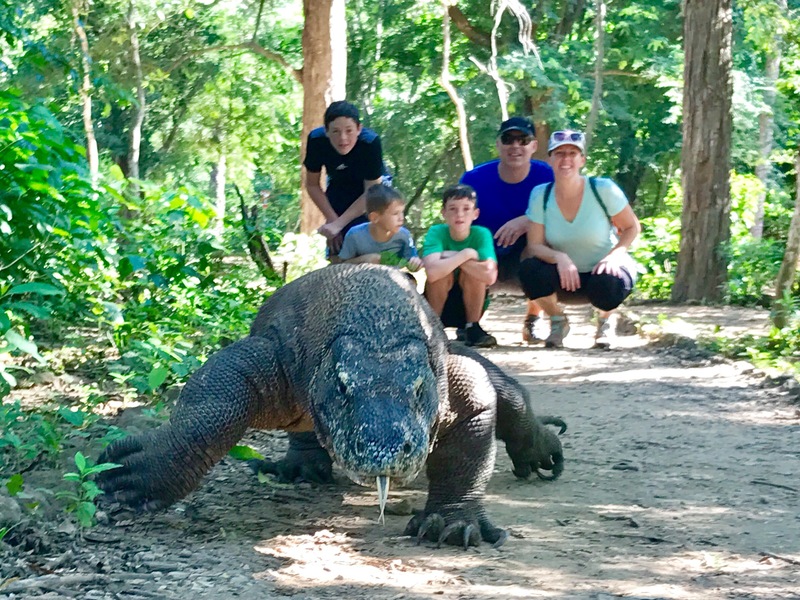 A lot of people have asked us if we were scared seeing the Komodo Dragons. Well, yes and no. We weren’t running away screaming, but we did keep a respectful distance at all times and were very cognizant of the danger we could be in if we didn’t behave as instructed by our guide. 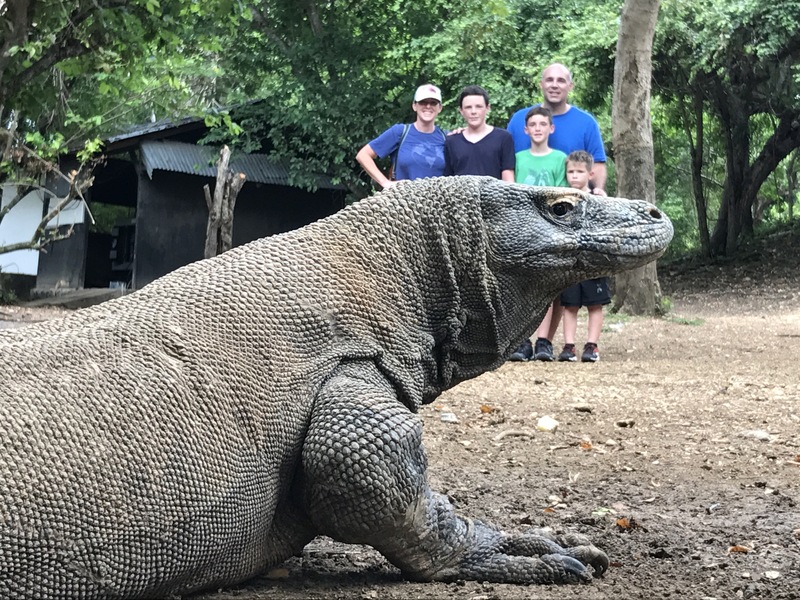 While Komodo Dragons are carnivores, they mostly eat carrion (animals that have already died), although they will ambush prey if they get near enough to them, often times knocking them down with their strong tails. They have a great sense of smell and can locate a dead or dying animal up to 6 miles away. 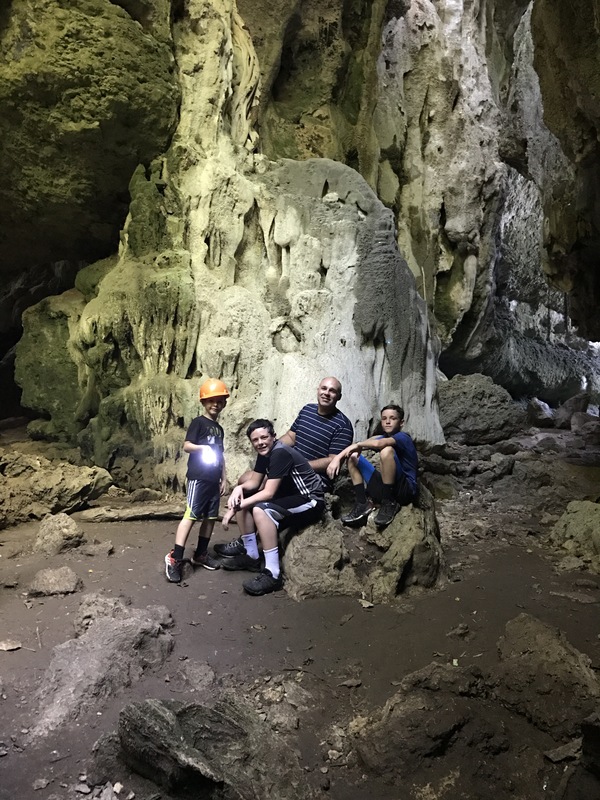 So, since we weren’t dying, we weren’t getting too close, and most importantly had a local guide with a BIG stick, we felt relatively comfortable. 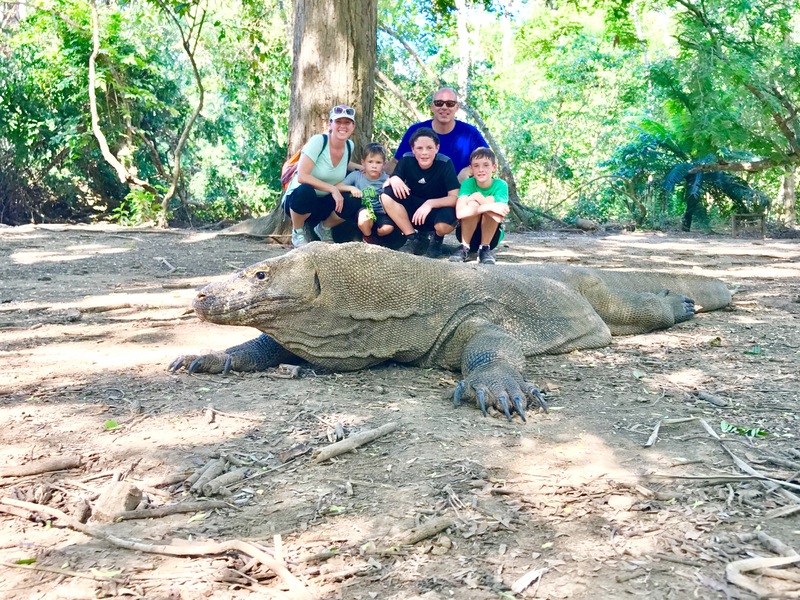 We did recently read about a man who was attacked by a komodo dragon, but he refused to pay for a local guide and tried to get really close to get a better picture. We’ve found common sense in traveling will protect you from many of the things that can go wrong. The time I felt the most scared was for our guide when he was taking the picture below. Bless him for trying to get a great shot (which he did) but that dragon just kept walking toward him as he was crouched down taking the picture and he had to keep jumping up and scooting back again and again. We kept telling him it was fine, we didn’t need the picture, but he insisted! 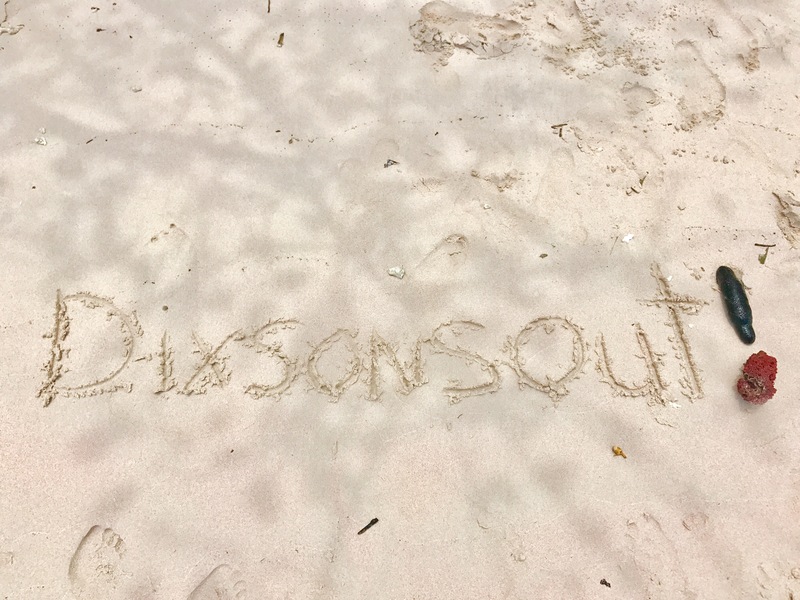 After we said goodbye to the dragons, we took the boat over to Pink Beach to snorkel and relax. 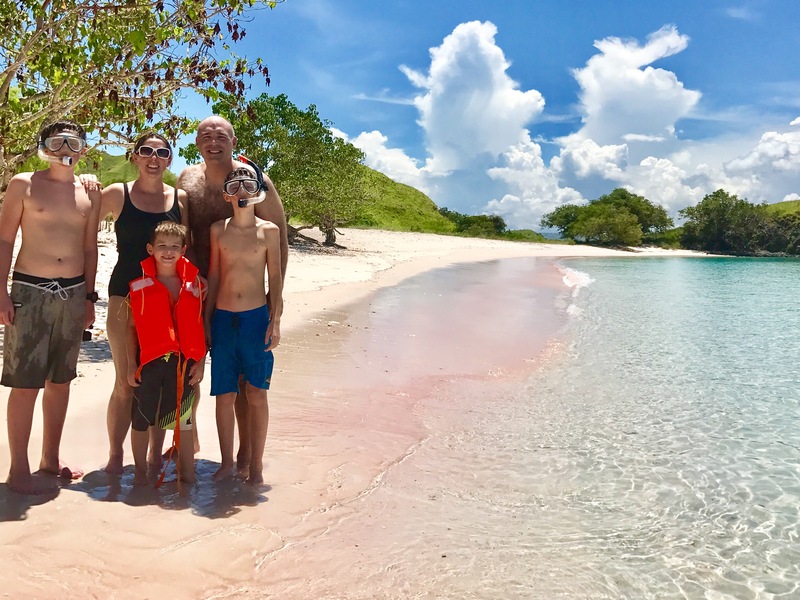 This was a beautiful beach that had partially pink sand because of the amazing active coral reef surrounding the island. It was the most amazing snorkeling any of us have experienced. The variety, size, and intense colors were a joy to behold. 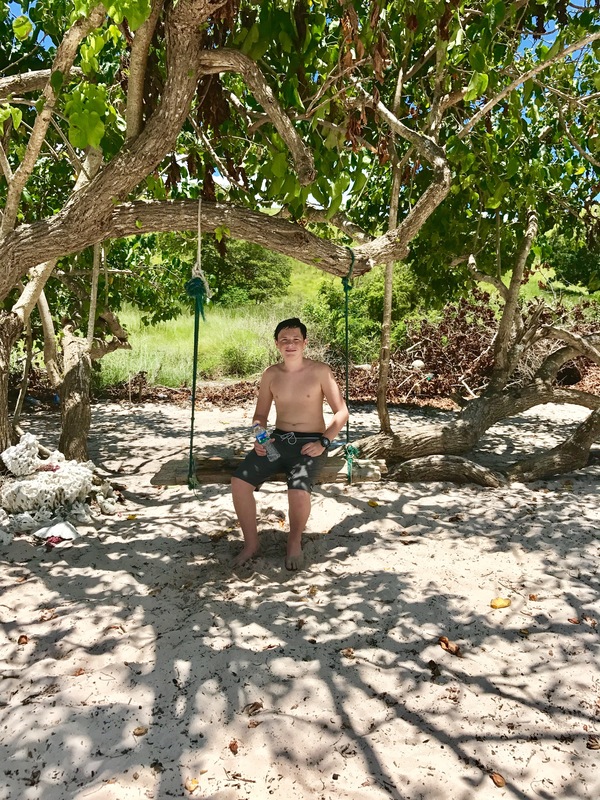 I didn’t get many pictures of Tyler on the beach because he and our guide, George, didn’t get out of the water the entire time! 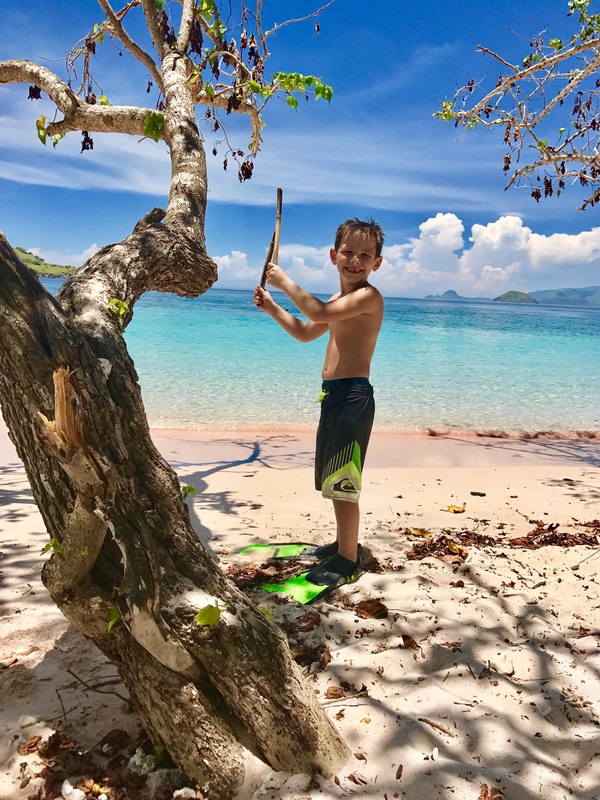 Parker’s friend the sea cucumber…We need to get this kid back to civilization soon! 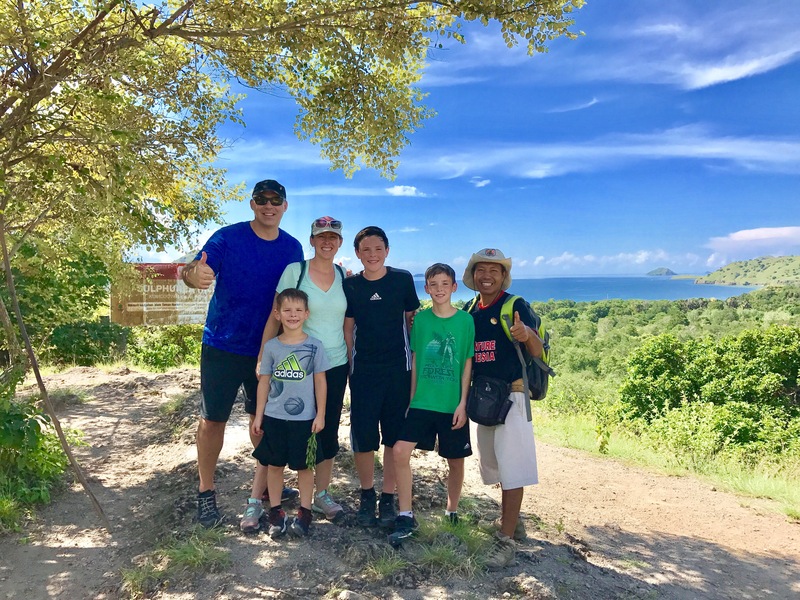 After getting our fill of snorkeling, we made our way back to Flores to stay the night before spending a little time on the island then heading to Bali the next day. 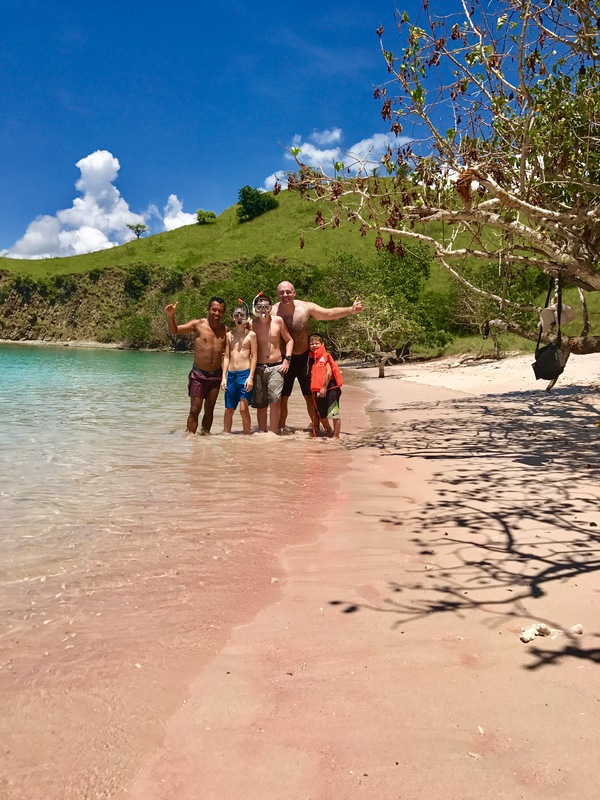 As I said earlier, I would love to have had more time so spend on the actual island of Flores, it was so beautiful and the mobs of tourists in Bali hadn’t seemed to discover this area yet. 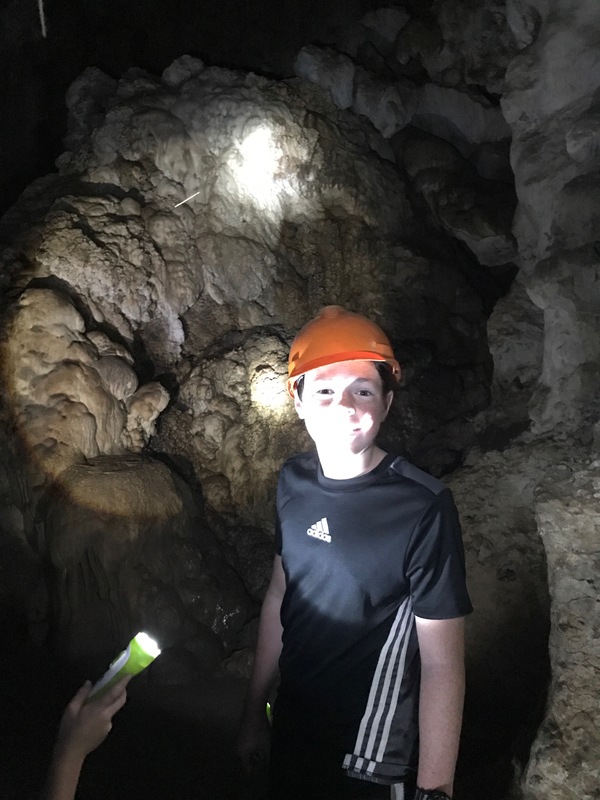 In our one day there we were able to explore some caves, go to a local market and be guest lecturers at a tourism school! The last on that list was more of an impromptu discussion organized by our guide. 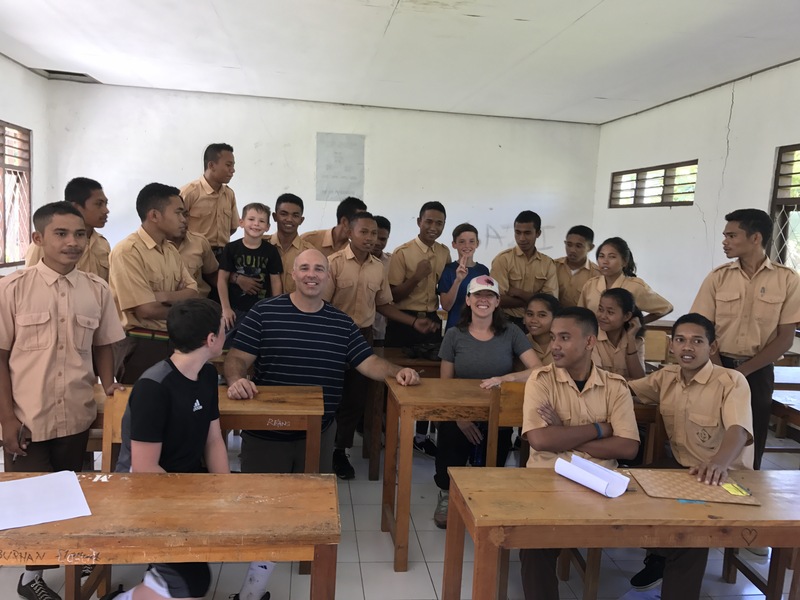 After exploring the island on our last day of our tour, our guide asked us if we would visit the school his kids attended. He said they would love to hear from us about why we felt like traveling was important, and why we would want to travel at all. Although the students are going to school for tourism, they don’t really understand why people travel, and what value it can have. 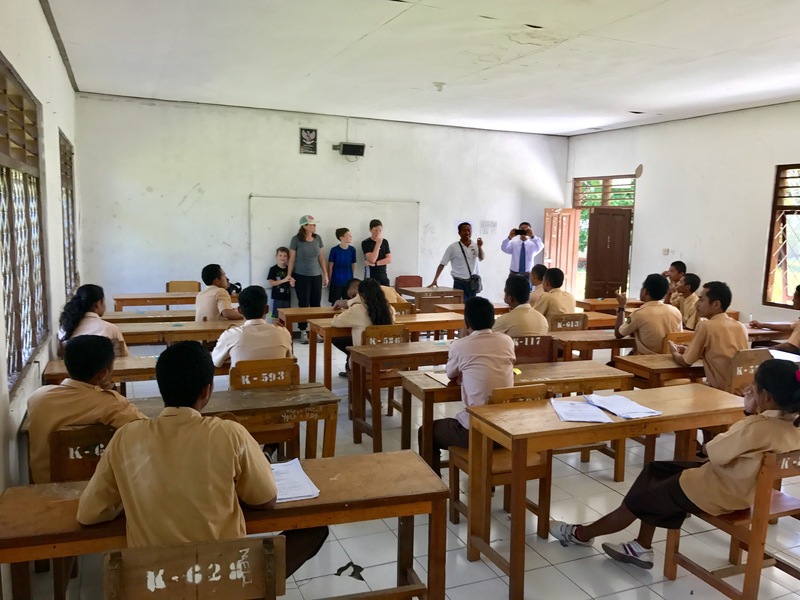 It was a really fun experience to meet with the teachers and students, letting them know about the importance that we felt travel had in our own lives and others. We also had an opportunity to answer some of their questions and have them answer some of ours. 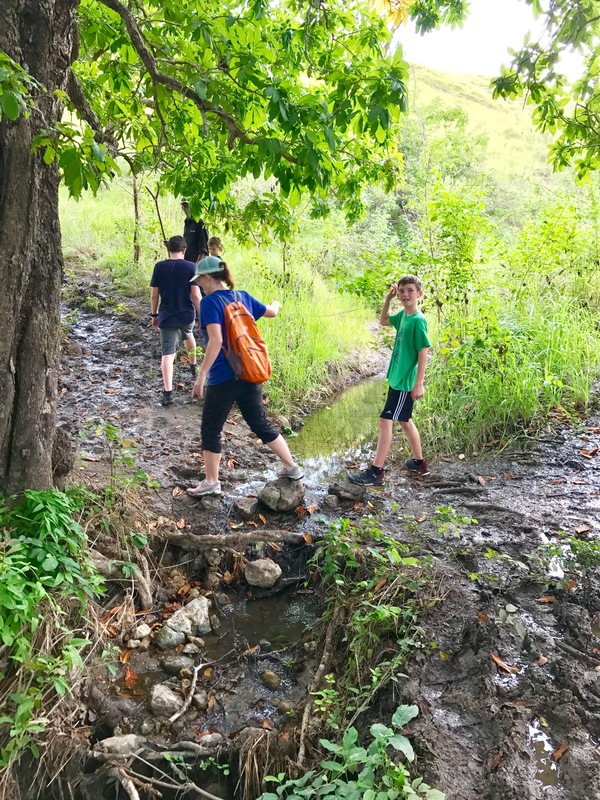 Overall, we had a great time out finding Komodo Dragons and also finding an island we would like to explore more in the future, using some of those students as our local guides! Wow – thanks for sharing. These posts always bring a smile to my face…thanks for sharing them. I hope you have this blog made into a family book when you’re all done. 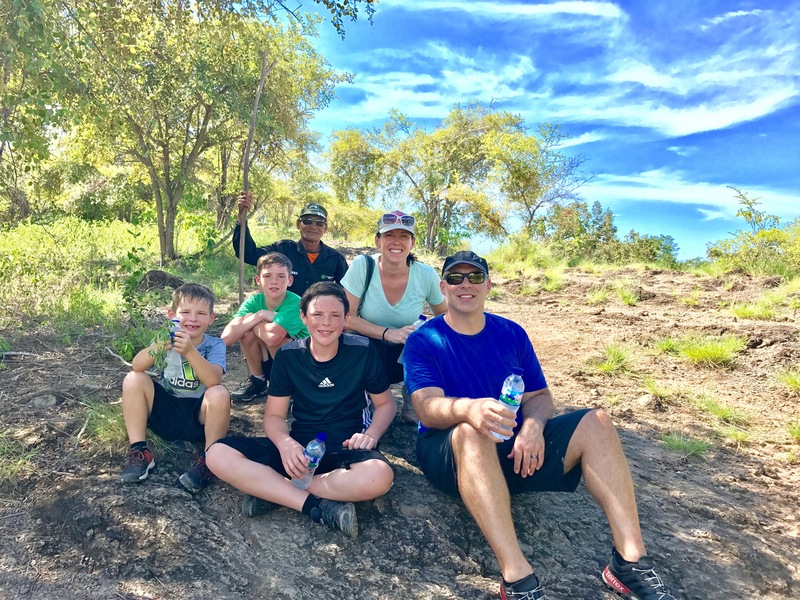 Let me know if you want me to share with you what we used when we did ours. Thanks Kevin! Yes, that’s the plan to make it into a book. I’ll definitely contact you to find out how to do it when we get back.